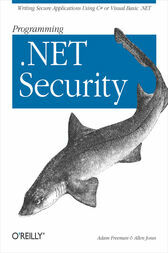 If you program with ASP.NET will also learn how to apply security to your applications. And the book also shows you how to use the Windows Event Log Service to audit Windows security violations that may be a threat to your solution.Authors Adam Freeman and Allen Jones, early .NET adopters and long-time proponents of an "end-to-end" security model, based this book on their years of experience in applying security policies and developing products for NASDAQ, Sun Microsystems, Netscape, Microsoft, and others. With the .NET platform placing security at center stage, the better informed you are, the more secure your project will be.